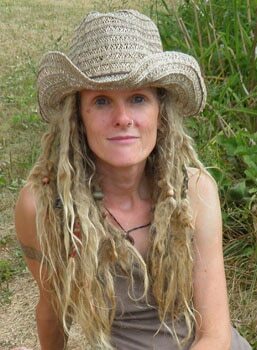 I’m thrilled to feature Kristine Brown of Herbal Roots Zine on Herb Geek this month. Kristine’s child centred approach to herbalism is not only refreshing and engaging, but it also responds to a much greater need for community-based education that embraces a nature as an integral part of health and wellness. A wealth of this pertinent information is available on Kristine’s website. If you are a parent, caregiver, educator, or community leader who is invested in the future of education and the implementation of nature-based activities, then prepare to be inspired! All the beautiful photos in this article have been provided courtesy of Kristine Brown. Melanie: As the mother of a young toddler, with another one on the way, I’m particularly attracted to your programs and offerings on Herbal Roots zine. 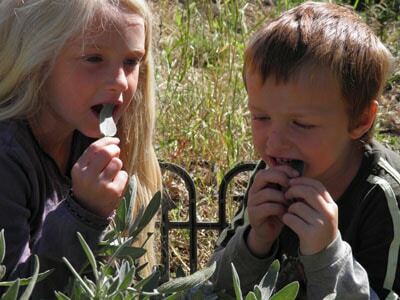 Can you share why it’s important for children to be actively engaged with plants? Kristine: Our society has become disengaged from the natural world and in doing so, we’ve lost touch with an important part of ourselves. I see the plants as a natural part of our health, along with pure food and water. 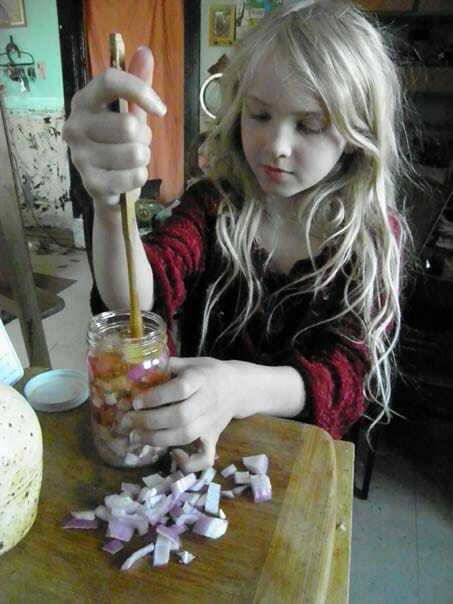 By teaching children to work with the plants, we are helping them to tap into a very important part of their being and helping them to reclaim something we have lost and so desperately need to get back. Being in the natural world and in nature, working with plants, develops our spiritual side and connects us back to the very earth we are a part of but have mostly forgotten or left behind in our eagerness to be modern and technologically advanced. Also, generally speaking, our society has lost the ability to take responsibility for ourselves and our health. We need to reclaim our confidence and instinct for self preservation. We need to know we can rely on ourselves to keep ourselves healthy and to heal ourselves when we are ill. We have become so reliant on the medical system that we don’t even know what to do when our child has a simple sore throat. We don’t trust ourselves to be able to confidently treat the sore throat at home and go to the doctor for every simple ailment. We need to allow ourselves to trust our instinct and know that we have that ability inside of us to deal with simple illnesses and wounds at home and having a working knowledge of the plants gives us that confidence to be able to take responsibility for our own health and to have the ability to trust our instinct when it comes to common illnesses. Plants have so much to teach us besides their value as food and medicine. They teach patience, persistence, appreciation, nurturing skills, respect and to trust our intuition. There are so many amazing lessons we can learn from working with the plants. 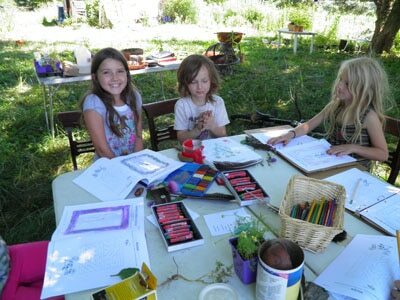 Melanie: I love how you encourage children discover the medicinal uses of plants through their own intuition. For example, in your article on How to Teach Kids to Use Plants, you recommend that parents allow children to discover through their own trial and error, rather than through didactic learning. Have you found this learning style to be particularly effective? Do children tend to remain more actively engaged with their learning when they’re being self-directed? Kristine: I do find that kids tend to have longer interests in subjects when they are allowed to work at their own pace and as much or little as their interests demand. Plants are a part of our daily life here, whether it’s the ones we are growing for food, the ones we are growing for medicine or the ones we are growing to feed our animals. 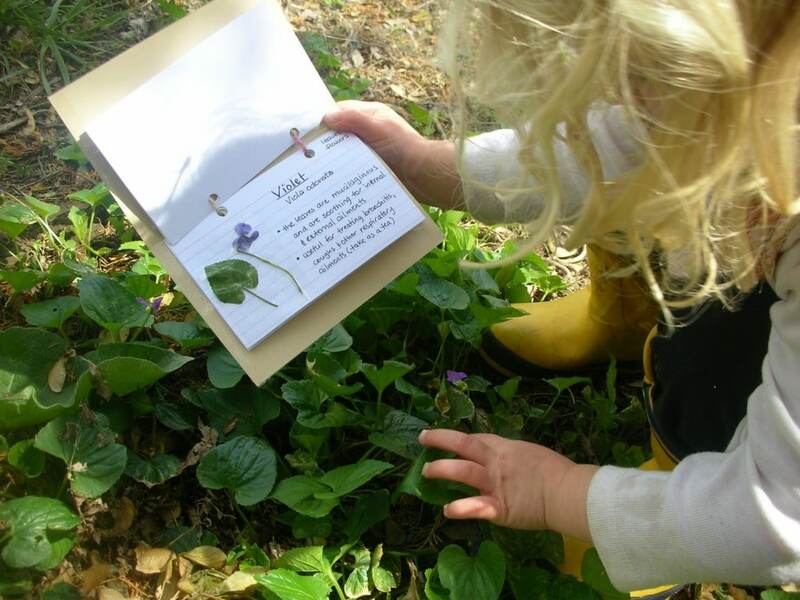 My kids have a natural curiosity about the plants and when they come out to the garden with me or out to the woods to explore and harvest, they are constantly examining the plants around them and trying to figure out what they are and what they could be used for. Some guided learning is always good but I never try to squelch any self directed learning either. If one of them finds a plant and wants to explore the uses of it, I allow them to (presuming that the plant is not a harmful plant of course). 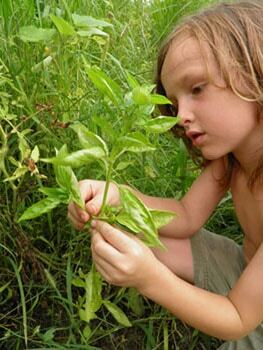 Melanie: At what age are children able to start benefiting the most from learning with plants? 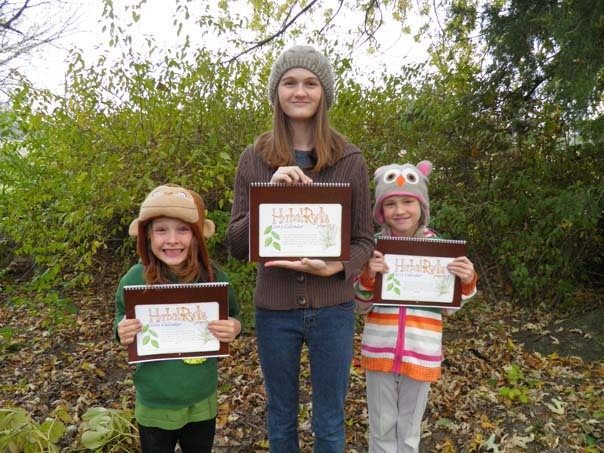 Have you noticed a cumulative interest when they start young, or is there a particular age when they’re most receptive to plant-related activities? Kristine: Most of my kids have been immersed since they were old enough to toddle behind me in the gardens and sample the plants growing around us. My youngest, who is now turning 7, learned around the age of 3 to use Plantain on bee stings and cuts and would run and get a leaf for anyone who had the misfortune to step on a bee or cut themselves. Using herbs is part of our lifestyle, they don’t know anything different so they naturally absorb the knowledge without thinking any differently, just like kids do in learning to read and write, ride a bike or tie their shoes. At the same time, when I teach to school aged children at different events, I find that a lot of them seem to hunger for the information and though a few may find it strange that we can use the plants for medicine, most of them are easily won over when you start talking about the fruits and vegetables they eat and the nutrition they gain from those foods. When they realize that all plants purposely have value, they easily grasp that they can also help to heal us just as easily as they can help to nourish us. I have found this to be true with just about every age group I’ve taught, from early elementary to high school. Melanie: Working with children in a home setting seems like the easiest place to start. 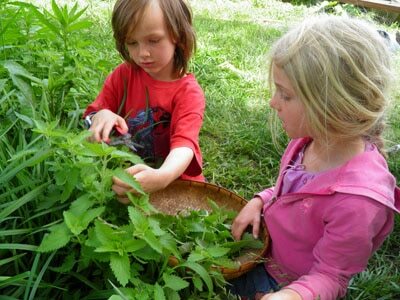 In Teach Your Kids to Use Herbs, you offer a number of suggestions for teaching kids about herbs in a classroom setting. I love the idea of planting an herb garden as a classroom project, or introducing herbal medicine-making as part of a study of pioneer times. Do you know of any classrooms that have successfully incorporated herbal learning in their curriculum? Kristine: I have not heard back from anyone who is currently incorporating this in their classroom though I have talked with several teachers about the possibility of doing it. I know of charter schools and Waldorf schools who incorporate different themes in their curriculums which include using plants as medicines. I would love to hear from any classrooms that have done it though! 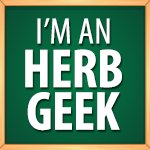 Mostly, my contact has been with homeschoolers and libraries that have offered classes specifically about herbs. Melanie: Your website Herbal Roots zine is chock-full of amazing resources. Can you describe the different activities you offer as well as any plans for the future for Herbal Roots zine? Kristine: Herbal Roots zine started out as a monthly PDF zine that I sold on my personal blog. When it quickly grew in popularity, I purchased the domain to turn it into its own little website. Right now, in addition to the monthly PDF zine there are some fun things to do on the website such as the herbal jigsaw puzzles and a group Flickr page where subscribers can add pictures of their explorations with HRz. I also have a page of resources with lists of books, websites, games and other herbal related information. Any time I come across a new resource I add it to the list. There are suggestions for adapting popular children’s games to help with learning about herbs on the website as well as a free Herbal Bingo game that can be downloaded and printed. I’m in the process of recreating the website so that will be a fun place for kids to visit, learn about herbs, meet other kids who are doing the same and share their experiences. I hope to start offering mp3’s of the songs and stories that are in each month’s issue as well. 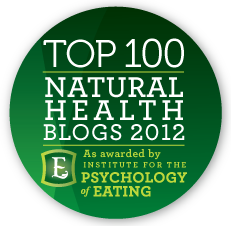 Melanie: Thanks so much for sharing all your wonderful insights. Where can parents and children sign up for your programs? Kristine: Information on subscribing, purchasing back issues and getting a free copy to preview are all available at my website: http://www.herbalrootszine.com. 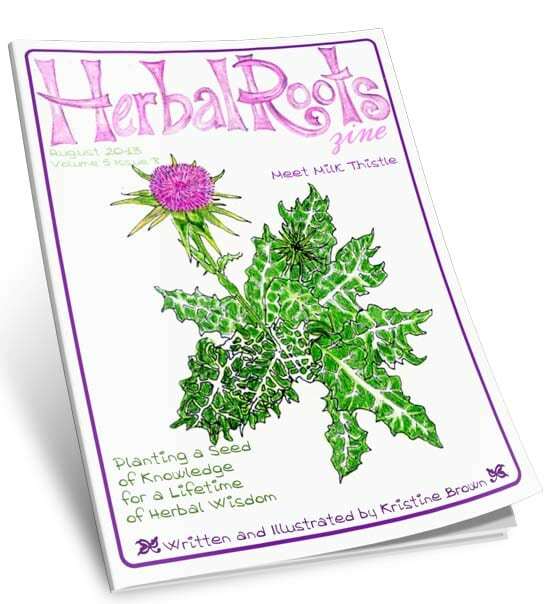 Thank you Melanie for giving me this opportunity to share a bit about how to teach children about herbs and Herbal Roots zine with your readers!